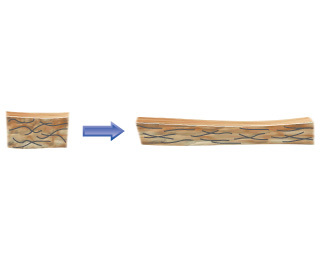 Solution: When most elastomeric polymers (e.g., a rubber band) are stretched, the molecules become more ordered, as illustrated here: Suppose you stretch a rubber band.Try this experiment: Stretch a rubber band and wait a moment. Then place the stretched rubber band on your upper lip, and let it return suddenly to its unstretched state (remember to keep holding on). What do you observe? Suppose you stretch a rubber band. Try this experiment: Stretch a rubber band and wait a moment. Then place the stretched rubber band on your upper lip, and let it return suddenly to its unstretched state (remember to keep holding on). What do you observe?